A dance and music performance inspired by the poetry of Elsa Gidlow. 8pm Saturday, April 18th, 2009. 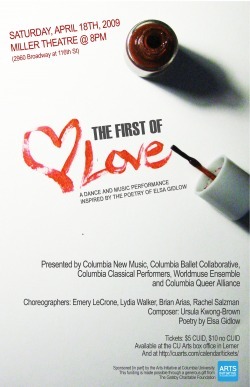 Presented by Columbia New Music, Columbia Ballet Collaborative, Columbia Classical Performers, Worldmuse Ensemble, and Columbia Queer Alliance. Choreographers: Emery LeCrone, Lydia Walker, Rachel Salzman, Bryan Arias. Supported [in part] by the Arts Initiative at Columbia University. This funding is made possible through a generous gift from The Gatsy Charitable Foundation. Diana Daniel, soprano soloist. Elliot Moore, conductor. Choir: Amanda Gregory, Anne Donlon (sopranos). Juliet Forshaw, Marina Evans, Kate Smith (altos).